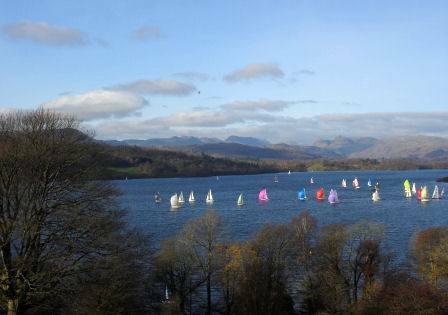 The Windermere Way is a 45 mile (72 kilometre) long unofficial route which circles Lake Windermere, the largest lake in England. The route takes in the summits of Wansfell, Loughrigg Fell and Gummer's How and passes through the towns of Ambleside and Windermere. 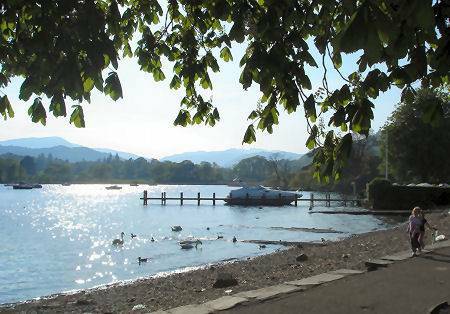 * Bowness to Ambleside commences at Bowness Bay and continues northwards along the lake climbing Orrest Head, which provides excellent views of the lake, the route then descends to Troutbeck before climbing Wansfell Pike, which at 1,601 feet ( 488 metres) is the highest point on the walk. * Ambleside to Ferry House From Ambleside the walk ascends Loughrigg Fell, then drops to pass pleasant and sedate Loughrigg Tarnbefore continuing to Wray Castle. This section of the route then ascends Claife Heights, before concluding at at Ferry Nab. * Ferry Nab to Lakeside this section traverses the western shore of Windermere, passing High Dam at Finsthwaite before concluding at the Lakeside Steamer Pier. * Lakeside to Bowness The final section returns to the starting point of Bowness Bay.